Thinking of a good gift to give to your loved ones will mean looking and searching for all kinds of personalised gift ideas offline and online. Magazines, newspapers, visiting the store, visiting an online store, and the like are just some of the many ways to find good ideas for gifts to give to your family and friends. But despite it being time consuming and tiring at times, the effort is really worth it when you see the smiles on their faces and see the gifts being used to its full potential. Coming up with personalised gift ideas, one of these could be a oil painting on canvas that can be hung on the walls of your home. We at Direct Art Australia believe that this is a great personalised gift that people of all ages and backgrounds will love, which is why we have a wide selection of oil canvas paintings that uniquely done by our professional artists. The nice thing about an oil painting on canvas is that they come in various colors and subjects, so there's one for everyone in your list of friends and family. A famous reproduction of a classical painting is also a great idea when looking for unique personalised gifts for your loved ones. These paintings are high quality reproductions of the original work, which we all know are impossible to get a hold of nowadays. These reproductions are very much like their original counterparts, so if you have a mom who loves a particular artist or a dad who's been looking for a famous painting, you can get them these at a much cheaper price. A portrait from photo is probably the most personalised gift idea you can ever think of to give to your family and friends. This is a special gift personalised to the bone because the portraits are taken from photos of special memories, occasions, and moments that can never be repeated. And with so many photos to choose from, it's no wonder that people love them so much. 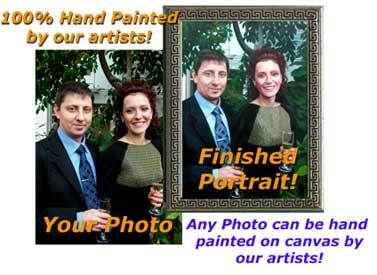 Direct Art Australia offers portraits from photo that are carefully done and processed by professionals in the field. Expect only the best portraits from us. Buying gifts should be a fun experience with meaningful intentions; therefore let us help you choose personalised gifts for your family and friends while offering competitive prices for each one. We offer free shipping to customers located in all Australian cities, including Melbourne, Sydney, Brisbane, Perth, and Adelaide.